The filmography of Clive Barker, limited in quantity as it is, has been a most interesting beast. From the whirlwind success of HELLRAISER, his directorial debut, to the recent re-evaluation (and resurrection) of his sophomore follow-up NIGHTBREED, Barker’s work has earned its place in the pantheon. Which is why it’s all the more surprising that his third (and final) effort behind the camera, LORD OF ILLUSIONS, has been relegated to relative obscurity (at least in the general public’s eyes) as a footnote of his cinematic career. A loose adaptation of his novella, THE LAST ILLUSION (first published in BOOKS OF BLOOD Volume VI), this was to be the start of many new things: for Barker, it was another step away from the ever-expanding (some would say smothering) shadow of the HELLRAISER franchise, a series that has strayed further from his original vision with each new (and cheaper) installment. It was also to be the start of a new franchise, featuring Barker’s long-suffering private eye, Harry D’Amour, a recurring character in multiple short stories as well as a featured player in THE ART trilogy. With lackluster box office and middling reception from fans and critics, though, it ended up being none of the above… and that’s a real shame. Because once you get past the grand expectations and preconceived notions, there’s a weird quirky little horror-noir mashup waiting to be discovered and enjoyed. Harry D’Amour (Scott Bakula), a New York private eye, finds himself hired to investigate threats against Philip Swann (Kevin J. O’Connor), the world-renowned illusionist. When Swann dies onstage during his most elaborate trick yet, D’Amour stays around to protect Swann’s widow, Dorothea (Famke Jansen, oozing 1940s femme fatale glam) digs deeper into Swann’s history and discovers the dark truths behind Swann’s talents. It all goes back several years to his time with The Cult of Nix, and his connection with the cult’s leader — a real-deal dyed-in-the-wool magician — who wanted Swann as his protégé. Ambushed by Swann and a small group of allies for his abduction of a young girl for sacrificial rites, Nix is bound and buried deep, deep away from the rest of mankind. Is LORD OF ILLUSIONS a lost gem? Misunderstood perfection, waiting to be rediscovered by the masses? That’s debatable. There are some pacing issues in the middle where not much happens aside from exposition on Swann and Nix’s history. It also trucks in some of the more clichéd aspects of film noir, with the romantic entanglement of D’Amour and Dorothea, feeling particularly forced and unnecessary. And, as time is wont to do, the special effects haven’t aged very well. But when it clicks, when it taps into the dark current of magic running through the narrative? Man, it clicks hard. 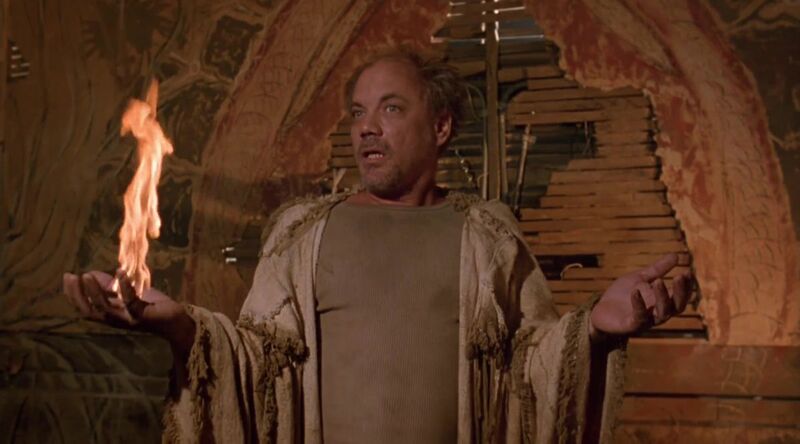 Nowhere is that better exemplified that in our “big bad” — Nix, The Puritan, as played by the late character actor, Daniel Von Bargen. Disheveled, dirty and wild-eyed, Von Bargen brings a world-weary gravitas to this aspiring demigod. It’s an underrated performance from one of America’s great character actors and a Barker antagonist that has been left in the looming shadow of Barker’s other menaces, Pinhead and Candyman. Which brings us to Harry. 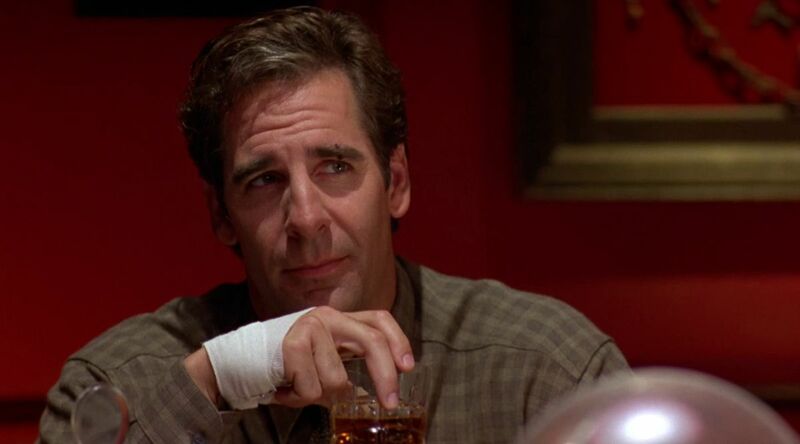 Barker has gone on record to say that Scott Bakula owns D’Amour now and has influenced the character’s appearances in other works, including last year’s “last Pinhead story,” THE SCARLET GOSPELS. And he’s very good here. An understated, blue-collar, everyday Joe even when the world around him is turning topsy-turvy. And like any good pulp detective, D’Amour’s got flaws and chinks in his armor. Plagued by nightmares from a case/exorcism turned very bad, more often on the receiving end of a beating than dishing it out and also a less-than-crack-shot, D’Amour is the classic “regular guy” trying to do the right thing. He’s no John Constantine — there’s no cocky swagger or magical aces up the sleeve for Harry. All he has is a snub-nose revolver, the will to do the right thing and a very open mind. When asked by Valentin, Swann’s major-domo, if he’s a believer, Harry responds with a sly grin: “Oh, yeah. I signed on for all of them in my time. Catholic, Hindu, Moonies. You can’t have too many saviors.” This was to be D’Amour’s grand debut, the beginning of many more cinematic cases to investigate with Bakula at the top of the marquee. A lackluster ad campaign, studio indifference and the subsequent financial and critical failure put an end to that, though. And fast. What makes it all the more a shame is it was our first glimpse of Barker’s evolution, both as a storyteller and a director. There is none of HELLRAISER’s elaborate violence nor NIGHTBREED’s menagerie of fantastic monsters and freaks. Much of the story is grounded in reality (of a sort), with the slowly creeping presence of The Puritan bleeding in from the sides, slowly building to the climactic showdown at the cult’s desert compound. 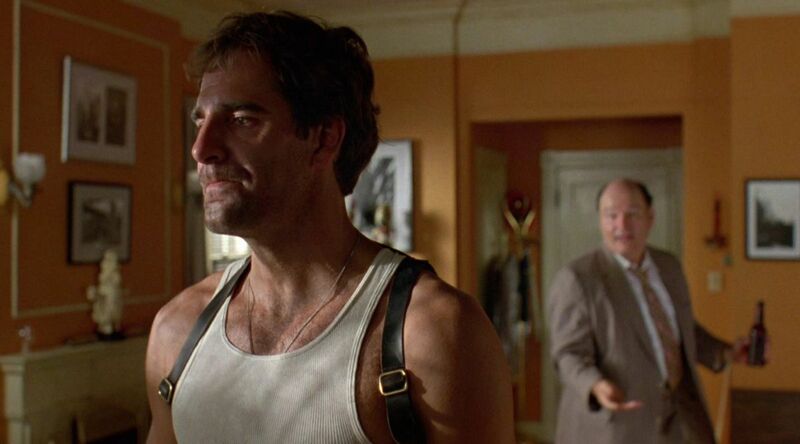 The performances are subtle, subdued, anchored by Bakula’s stoic everyman charm. HELLRAISER may be Barker’s most famous work and NIGHTBREED his most ambitious, but ILLUSIONS feels like his most mature work. It was a great leap forward that would sadly be his last. In an alternate timeline, somewhere out there, the Harry D’Amour franchise is a thing. Given time and support, it could have been a big thing, at that. More importantly, Clive Barker would have continued to make movies, growing and evolving as a filmmaker with each endeavor. But not in this timeline. And we’re a little worse off for it, too. Scream! Factory’s LORD OF ILLUSIONS Collectors’ Edition was released on Blu-Ray December 2014 and is available here. It contains both the theatrical and director’s cuts of the film (with commentary by Barker), as well as a sizable selection of behind-the-scenes features, including deleted scenes.